The Funky Felter: Thanks to Craft Gossip and Felt Planet! Thanks to Craft Gossip and Felt Planet! Perhaps you are the kind of person that is just a natural winner. I, on the other hand, don't remember winning anything in my life... until recently! I just wanted to give a big thanks to the Felting Blog at Craft Gossip and Felt Planet for their recent giveaway contest. I was actually a winner and am ecstatic about it. 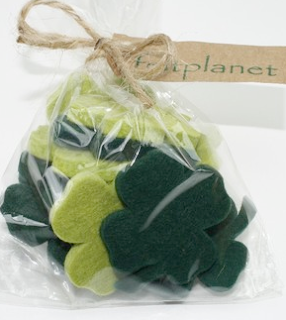 I won these lovely, thick wool felt shamrocks. Finally I have a great excuse to do something fun and crafty just for myself. I'm looking forward to incorporating these little beauties into a project. If you'd like to try your hand at winning, head on over to Craft Gossip to enter their latest giveaway contest for a gorgeous wool beret and felted rose brooch. It is really stunning! I know, I love these too and thanks for the giveaway mention :) Our baby arrived on the 7th 6.10# 19 inches.